Interesting interview with Duwayne Dunham, especially talking about watching "Eraserhead" in a theater with Kubrick and Lucas. He mentions how he cut S3 without Lynch viewing a scene while filming. I'm confused by what he means. Lynch would have viewed dailies, not just "recorded" the film and shipped it off to be edited without knowing how each day worked, right? Dunham I assume is talking about assembled scenes. Lynch, though, is very involved in the editing of his projects (and received a credit for it on this), no? This is making it seem like Dunham edited most of this without Lynch's input or at least without a close, side-by-side working relationship, which is weird and not what I assumed. Essentially, it sounds like Dunham did a preliminary edit while DKL was shooting, then DKL came in and reviewed and did his own cut. Which isn’t uncommon, and was probably a necessity on a project of this length. One thing that’s always confused me: I’ve read a number of interviews with Dunham over the years where he talks about that TP S1/W@H period, and he always seems to speak as if he edited TP S1, which obviously was not the case. "Frost hopes the show will continue. Lynch, for his part, politely declined an interview for this story, explaining via a representative that he had moved on from Twin Peaks and was focused on his painting." Doesn't sound like Lynch is interested in more Twin Peaks anytime soon. Maybe he'll change his mind next year. mtwentz wrote: Doesn't sound like Lynch is interested in more Twin Peaks anytime soon. Maybe he'll change his mind next year. This to me sounds like a plan to keep Twin Peaks in the headlines. We'll see if we get regular stories like this cropping up for the rest of the year etc. I mean, Sabrina Sutherland recently said she hopes there is more. Now Mark says he wants more? Also, what if some talks have already gone on with Showtime and Lynch is holding out for something? Or pretending to hold out for something. These guys all know how to play the media game. I'm pretty sure I remember that. Jerry Horne wrote: I'm pretty sure I remember that. That said, Lynch really is very passionate about painting, and I respect him for it. Hearing about the way he goes right into the studio every day and spends most of his time there is very inspirational. He didn't get to do anything else for a long time while he made season 3. Given his wide-ranging creative interests, I do think that we can expect him to focus on other things for a significant amount of time. What constitutes a significant amount of time, I can't tell you. What we do know is that he truly enjoyed making season 3, and was very happy with the way it turned out, so one of these days he could very well hear the wind in the trees and get right back into that world. Jasper wrote: That said, Lynch really is very passionate about painting, and I respect him for it. Hearing about the way he goes right into the studio every day and spends most of his time there is very inspirational. Now that sounds like a dream come true. yeah, lynch's relationship with painting is really inspiring. i think he mentioned he was painting again in a vulture interview? and it's all over the art life. actually i'm thinking about his ew interview where he spoke about working on furniture. anyways, his dedication to painting got me back into sketching again. but on a less personal note, it seems he derived a lot of visual inspiration for the return from his painting and it seems integral to his artistic process. so this is a good thing in my opinion. use that brain space for art, not media interviews. Mark just tweeted that Vanity Fair piece where they say he wants more Twin Peaks. Jerry Horne wrote: Mark just tweeted that Vanity Fair piece where they say he wants more Twin Peaks. That's good. Looks like we can probably take that to mean that he doesn't feel as though they've misrepresented his feelings with regards to continuing the story. yeah, at this point it feels like Sabrina is basically a surrogate for DL and if he wasn't interested at all in continuing in the future she would put a little water on the season 4 anticipation fire. didn't she say recently she was helping david figure out what his next project would be? going through his box of ideas? While her comments do seem to support the possibility that there could be more Twin Peaks, her musings really make it seem as though nothing is in the works at this time. 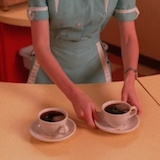 Being vague and evasive is one thing, but speaking so much about what it will mean if there is not more Twin Peaks doesn't seem like what someone would do if they were trying to hide something. Then again, maybe Sabrina Sutherland is simply the most savvy player in the TP interview game.